Don’t have a car? Feeling bored? The sun is shining? The answer: BIKING! Biking is an easy way to travel throughout campus and, with bike racks readily available on campus, you just need to provide the lock. Bike racks can be found outside the main doors of most buildings and residence halls, including Knutson Campus Center, the Integrated Science Center, and Grant Center. 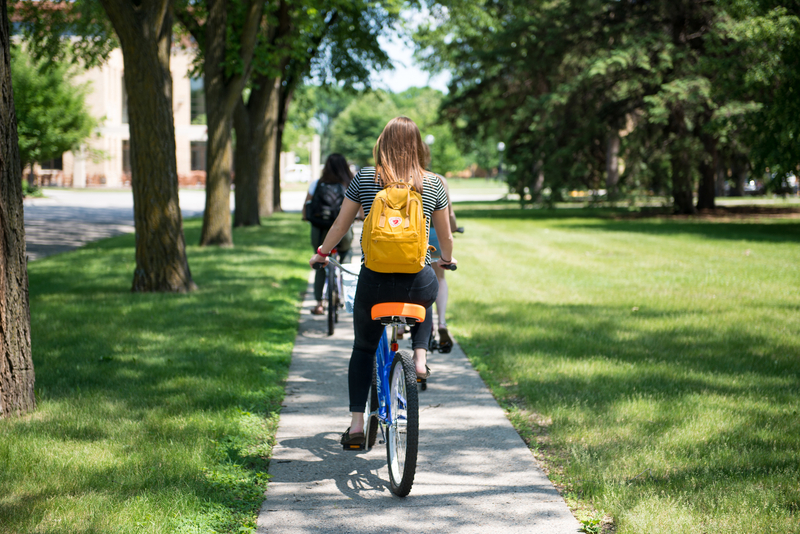 With the speed of bikes, you can hit the snooze button a few more times before class and still be on time! Don’t have a bike? There are bike shops all around the Fargo-Moorhead area, including Great Northern Bike Co., Paramount Sports, and Scheels. With a wide variety of options, you can be sure to find a bike that fits your needs as a new or experienced biker. 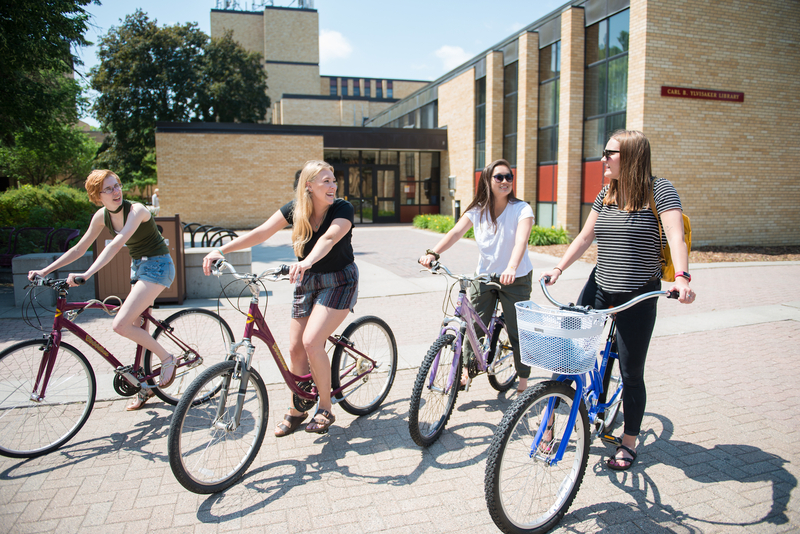 If purchasing a bike is not a long-term commitment you want to make, Concordia offers the COBBikes Bike Share program, which allows students to check out a bike from the library at no cost for four hours to get around campus or to explore the F-M area. Another rental option is through Great Rides Bike Share. With stations primarily in north Fargo, it can be an ideal option for exploring downtown Fargo. Great Rides charges the rider $4 per hour – all you have to do is check out the bike with your credit card, enjoy the ride, and return it to any station. Flat tire? There is a fix-it station next to the COBBikes rack across from Knutson, offering a tire pump free of charge. When the winter months roll around and you aren’t planning to cycle, you can securely lock your bike to any rack outside your residence hall or apartment as long as you have registered your bike through parking services – no fees included. 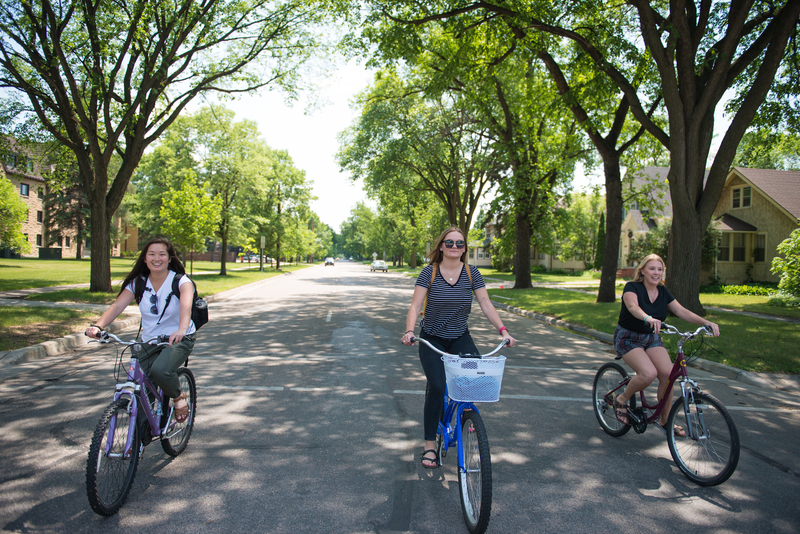 With so much to explore, biking is a fun, active way to get around the Fargo-Moorhead area. Outside the hurry of the city, the community offers many lush parks with paths perfect for biking. 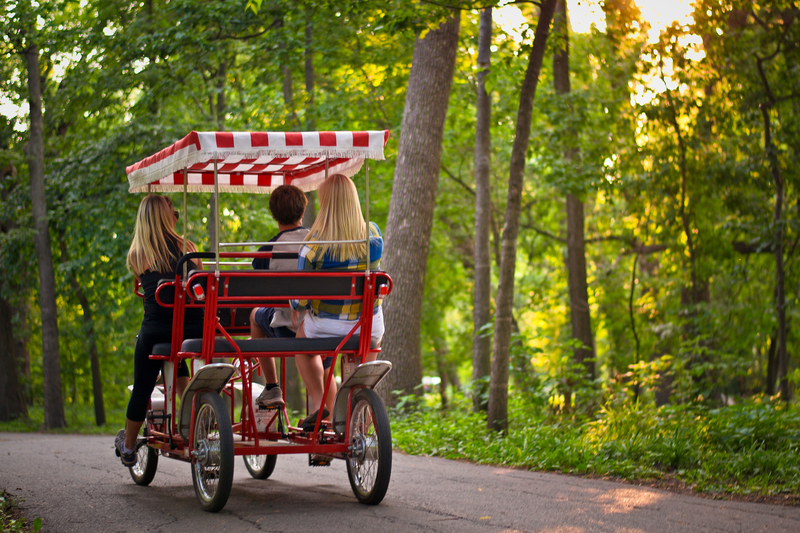 Gooseberry Park in Moorhead offers beautiful greenery with modest trails for a relaxing bike ride. Crossing the pedestrian bridge leads you to Lindenwood Park in Fargo, where you can follow the path along the Red River to downtown Fargo. Lindenwood also offers bike rentals, including tandems and surrey bikes, creating a great opportunity to enjoy the outdoors with friends for a daytime adventure. Just north of the Heritage Hjemkomst Center (the building with the Viking ship), Oak Grove Park offers a trail weaving through the beauty of nature along the flowing river. If you need a break, the frisbee golf course is the perfect solution. With a bridge north of downtown Moorhead, Oak Grove Park is easily accessible to enjoy any warm, sunny day. More parks in Fargo include Trefoil Park and Island Park, both offering beautiful trails and a break from the bustling world. If you’re lucky, you may catch views of model airplanes flying through the sky by the F-M Skylarks Club at Trefoil Park. Aside from the action of parks, biking can also be a way to meet new people. Great Northern Bike Co. offers free weekly rides for anyone looking to participate. Rides happen each night with varying levels of intensity and length. 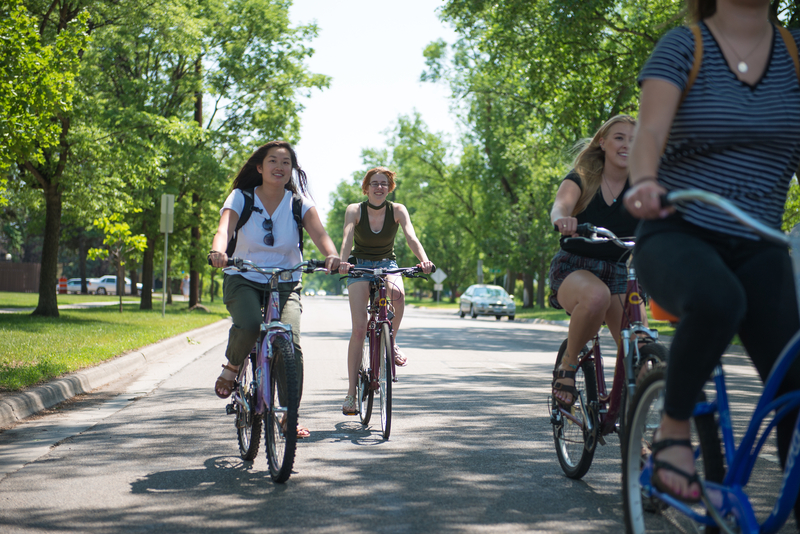 Grab your bike and some water and join the groups taking on the streets of Fargo. 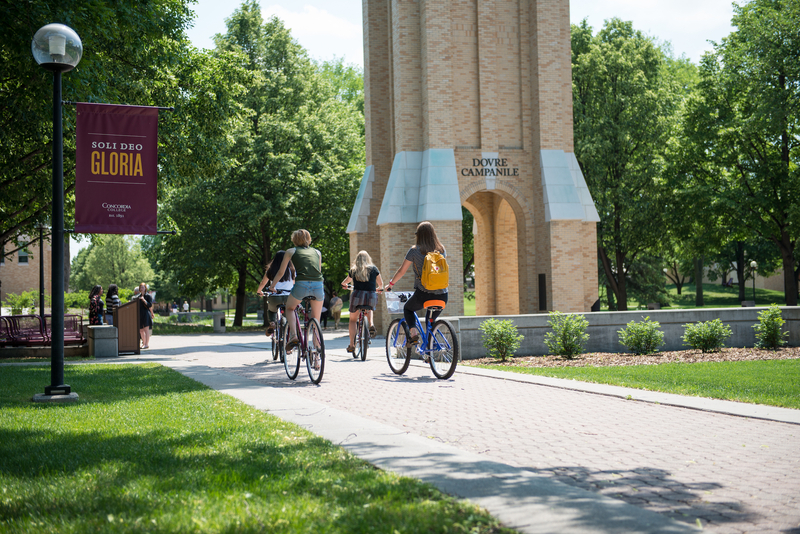 Get to know fellow Cobbers this summer at a Fargo-Moorhead bike tour starting right on campus! All prospective students are invited to explore the F-M area on COBBikes. Our bike tour events are scheduled throughout the summer. So next time you catch yourself sitting inside on a beautiful day, challenge yourself to get on a bike, go explore, and see where the day takes you!